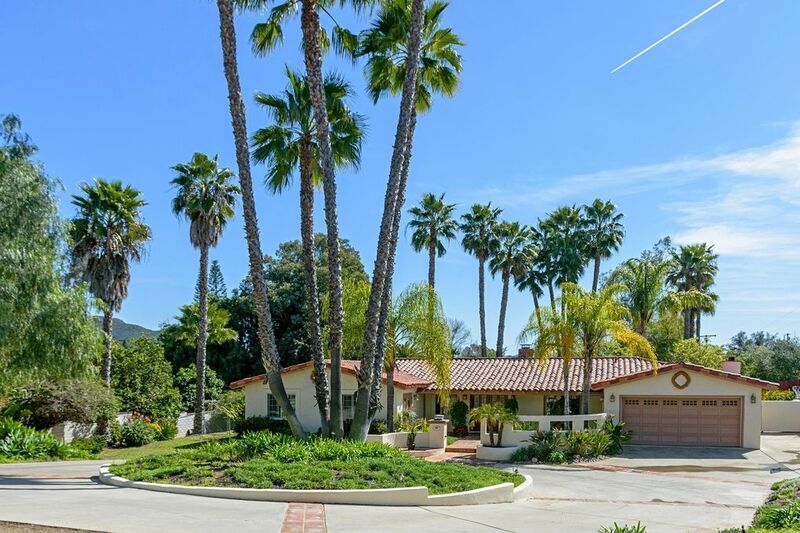 Absolutely gorgeous Rancho Santa Fe style Southwest Escondido estate home on a fully enclosed and beautifully landscaped acre located just a few minutes off the freeway and zoned for Escondido's best schools. This single story home has 4 bed/3 baths and 2397 SF. The backyard is extraordinary with a resort-like covered patio which overlooks the pool and outdoor kitchen and truly offers outdoor living at its finest. This is a very rare offering for such an affordable price and will sell fast. Other amenities include full circular driveway, gourmet kitchen with genuine oak cabinetry, gas range, granite counter tops, built-in desk plus breakfast nook with padded bench seating, under-counter kitchen lighting, genuine oak cabinetry, walk-in pantry, pool bathroom, solar panels (owned), epoxy garage floor, whole house fan, family room surround sound, two fireplaces, ceiling fans throughout, huge "wall window" looking out to backyard from living room, hot tub just outside master bedroom patio doors, walk-in master bath shower with rainmaker shower head, and over-sized master bedroom walk-in closet.